You seem to have had a very interesting journey. Why did you decide to take on such a complex instrument like the kora? Mine has been a nomadic journey really. Initially, I started out by playing Ugandan folk instruments; namely the xylophone, thumb piano and the like. It was during my travels to the Western part of Africa that I discovered the kora, an instrument as complex in its design as it is in its musicality. I found that it blended with the style of music that I play. I went to Senegal (2005) for eight months, Gambia (2005) for three months, and the Guinea-Conakry (2006) for five months. During this time I had a deep experience of the kora and explored different playing styles in search of my own voice. Speaking of musical style, what would you say it is? Internationally, it is categorized as world music. 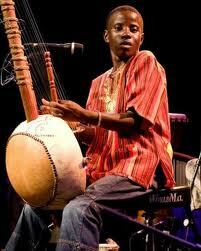 It is a fusion of traditional Ugandan and West African music. How challenging is it for you to stick to this style of music? I wouldn’t term it as that. Many people find it hard to understand what I am saying in my songs because I often sing in a different language. That, however, is not the strongest point. 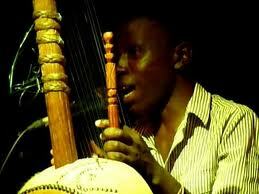 A Ugandan playing the kora is a paradox of sorts. One would expect me to be using our own instruments and sing in our local languages, but I chose to explore a different avenue. The real challenge is in living up to expectations, leaving a mark on society. There is no room for mediocrity. The kora is a very challenging instrument since you are constantly playing the melody and accompaniment. I am still learning to keep pace with the global players and styles of play. Musical influences have been around me for a while, from as early as primary school. We used to attend inter school festivals. When I joined Makerere College School, at the age of 13, I decided to take folk and roots music on fully and become famous for it. I want to leave a legacy for posterity. Do you believe you have reached a certain level of mastery of the instrument? I have come quite a distance in the past 6-7 years and I believe I can now be considered a great player. Of course, players like Ba Cissoko (Guinea) and Toumani Diabate (Mali) are world class. You also have to know that it is about how you communicate with the audience through your instrument. How do you touch their hearts? You could be a slow player but have performance that reaches the audiences. I believe I have made my mark. I am one of the few players who have brought the kora to Southern Africa. Do you think you have a growing audience for the kind of music you play? Yes, I think so. In terms of Uganda, it is easy to gauge. In the past three years, I have done five to six major projects. New Ancient strings, Ethno Uganda, I speak Luganda and two editions of the Diplomats’ Tour. With such, you can see the trend and how tremendous the growth is. Three years ago, my first show was three thousand Uganda shillings. Today, my shows go for fifty thousand shillings (30 Euros). What do the next five years look like for you as a musician, artist? The future for me is world and folk music. That is what has made me. It is going to be used to experiment further. This year, world music will be for the people. It will have an urban twist, lots of electronic influences and groove with socially relevant messages just like what the Goodlyfe and Aziz Azion sing. I am currently working on a project, the first half of which will be done by the end of March. A number of renowned artists are on it namely, GNL Zamba, Navio, Dr Hilderman and Aziz Azion featuring the Sundiata band. According to Sebunjo, what is the future of Ugandan music? It is difficult to define because the music has no identity. We are still trying to find ourselves. Audiences will take whatever you take to them. There are so many musicians with so little of a base to draw from. The scene is very vibrant, however. There is a lot to learn and hope still exists for the industry. His music has affected many audiences in diverse ways and he remains humble as an artist. He remains dedicated to his work and continues to take trips to West Africa at different points in the year for courses and independent research. 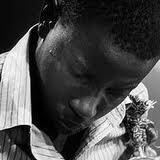 Some of Joel Sebunjo’s work can be heard from his myspace-page. Samuel a is a freelance writer with a varying range of interests namely; dance, film, theatre, music, photography, fashion. This makes great reading. We should have more of these! The very best solos seem to be more than improvisations of the melody of a song. They seem to talk to you in a way that reaches your heart. Listening to Joel Sebunjo’s song Nakato (featuring Jamal), the first thing that stroke my imagination was those last few bars of his solo before he sings in Mande, a language from West Africa. Instantly, I was teleported through my ears to a special landscape shimmering with a potent wisdom and serenity. This is what, I imagine, the griots of West Africa managed to do effectively well when they were still culturally and traditionally relevant, in bringing people together, calming quarrels between tribes, and being intermediaries through singing praise songs of those forefathers that we should remember. If this seems distant, it is not very different from the o’kulanya tradition in Buganda where one mentions the names of a multitude of forefathers going as far back as two hundred years in time. Nevertheless at that point in my listening to Nakato, an African identity was established within. Reggae is for lovers. From the Wailers to Sade’s album Lovers rock, reggae is the definition of Easy Listening. Its all in the lyrics and the laid back groove. The most arresting thing about reggae music is its alluring freedom. Freedom to speak out on what secrets are withheld in the heart, without fear or favor. Reggae is a bold declaration of love unabounding, overflowing in the heart. Reggae leaves a deep compassion in the heart of one who gives it decent attention. A song like ‘Namagembe’ sure enough got the attention of so many Ugandans, it had people from all over the country singing it at weddings; at kwanjulas; at graduation parties. It really was the kind of song that made people feel compassion in their hearts, and I find that Nakato has got what it takes to affect people this way. Mukama akunkuumire … tondeka Nakato omulongo, gives the perfectly nostalgic feeling of Lovers rock that Maddox’s Namagembe exudes. The single excels at succesfully making you dance, and feel warmth, the kora seizes to be an ancient or difficult instrument and for the moment, you are entranced by its ability to make you move. I like that Joel Sebunjo keeps on improving his abilities to communicate through the kora, thereby cultivating an African heritage of musical tradition, and sharing it with the rest of the world and most importantly staging a powerful African identity through music.